Happy New Year Caroline. I look forward to the new year with hope for a healthy, happy & prosperous one for all of us. Happy New Year Deb! Thank you for all your wonderful comments! May your 2015 be a fantastic year. All the best to you and your family. Happy New Year. Caroline! I wish you all the best in 2015! All my best wishes for a sweet New Year full of wonderful plans, peace and joy! Happiness for the year 2015! Best wishes for you and for all! Happy New Year to you also, Caroline! Looking forward to your next creations! 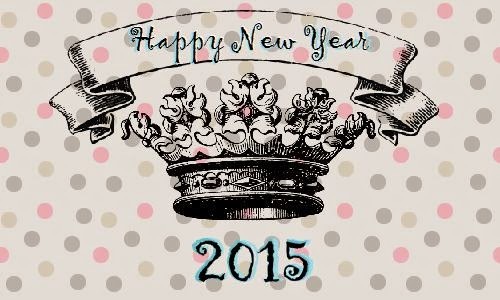 My very best wishes for you and yours in 2015, dear Caroline! Happy New Year to you and yours Caroline. I pray your new year is filled with blessings! Welcome to the Garden Spot, Caroline. I am so glad that you have joined me. I found Cinderella Moments as I looked for dollhouse inspirations, so when I signed on with it I did so from the Garden Spot. I started my dollhouse blog last summer, but don't so much with it. annsdollhousedreams.blogspot.com. I need to spend more time building it, but I seem to add mostly when I finish a project. Perhaps this year I will do more with the blog. I have one dollhouse that is a renovation project, a big farmhouse and a kit house to build, another large farmhouse. So I turn to you for inspiration and tutorials. I have gained the courage to build my own furniture and to make own chandeliers, following your tutorials and then adding my own twists. I will never be as good as you, for I am not an artist as you are, but i love your little houses and your Blythe makeovers. I look forward to seeing what you create in this new year. een gelukkig nieuwjaar en veel gezondheid. ¡ Te deseo un feliz 2015 ! Wishing you a fantastic 2015. Hola Caroline, aúnque tarde yo también quiero desearte un maravilloso 2015. Hope you've had a wonderful start of this new year! Best wishes!